Travel to Route 66 Vintage Iron in Miami for plenty of antique, vintage and retro motorcycles on display along Route 66. The tight, twisty curves of eastern Oklahoma attract motorcyclists like flies to honey, so leave the traffic behind and take to the winding roads of this stunning, picturesque area of the state on your next motorcycling road trip. Rev your engine and embark on an adventure through scenic terrain with twisting turns and stop at some of the best road-friendly attractions around. 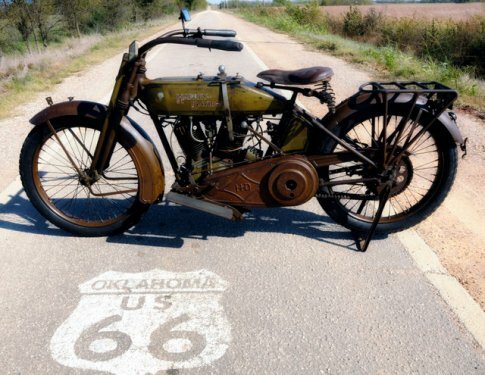 Whether it's exploring a new museum or finding the best diner eats in the county, this list of the top five roads for motorcycles east of Oklahoma City will have you shining up your bike in no time. If you’re looking for a nostalgic road trip, look no further than Route 66. Mention the Mother Road and immediately the old highway will bring back memories of a simpler time. Start your journey on “America’s Main Street” in Miami and seek out the Ribbon Road, an original section of Route 66 poured just 9-feet wide. While cruising in Miami, make sure to stop at Route 66 Vintage Iron, a popular motorcycle museum featuring many antique motorcycles on display including a 1919 GCS, 1971 Harley Davidson T-Magneto and a 1961 Triumph Bonneville Scrambler. Get back on the highway and find your way to the original Ozark Trail just west of Sapulpa. This trail pre-dates Route 66, but carried 3.3 miles of the highway until the early 1950s. Be on the lookout for the 1921 steel-truss Rock Creek Bridge, a 1925 railroad trestle and the ruins of an old drive-in theater. Heading west to Stroud, hungry riders will love the Rock Café. A literal piece of Route 66 history, the Rock Cafe's walls feature rocks from the original Route 66 road excavation. The café was built in 1936 and has been a popular Route 66 attraction for over 70 years. Stop in for delicious, unique menu items like the world-famous alligator burger and jagerschnitzel, a German dish. From Stroud, head west to Warwick for a stop at the Seaba Station Motorcycle Museum. Built in 1921, this nostalgic museum features over 65 vintage motorcycles from 1908 to present. Continuing west, there are two must-see attractions in Arcadia: the Round Barn and POPS. The Round Barn was built in 1882 by William Harrison “Big Bill” Odor and housed grain and livestock, as well as the occasional town dance, and was an instant landmark along the Mother Road when construction began on Route 66 just a short distance away. Don't miss nearby POPS, a much-loved Route 66 landmark and gas station that showcases a four-ton, 66-foot sculpture of a soda bottle covered in dazzling multi-colored LED lights. Top off your gas tank and treat yourself to more than 650 soda flavors. Located in southeast Oklahoma, the Talimena National Scenic Byway is widely known as one of the best motorcycle rides in the state. Hit this road to enjoy the scenic drive's abundant winding curves, beautiful scenery and rolling hills along the 54-mile stretch. Begin your adventure with a stop at Talimena State Park in Talihina, which marks the entrance to the Talimena National Scenic Byway. Continuing on your journey down the Talimena National Scenic Byway, be prepared for sensory overload, especially in the spring and fall when the surrounding foliage is at its peak. The surrounding Ouachita National Forest offers more than 352,000 acres of scenic vistas and hiking trails and is a great place to camp and hike after the impressive ride. Take a motorcycle trip on Oklahoma Highway 20 through Rogers and Mayes County and travel deep into the heart of northeast Oklahoma's Green Country. Begin this 38-mile trek at the Will Rogers Memorial Museum in Claremore to explore the life and accomplishments of Will Rogers, one of the most well-known celebrities of the 1920s and '30s, and view items from his extensive memorabilia collections. The museum plays Will Rogers movies daily and is a great way to learn about "Oklahoma's favorite son." Even experienced riders need to slow down for the ominous "Dead Man's Curve," a downward sloping hairpin turn. Heading east on Highway 20, cross through Pryor and continue over the Lake Hudson Bridge into Salina before turning north toward Spavinaw and hitting some great riding roads. This road is not for novices and even experienced riders need to slow down for the ominous "Dead Man's Curve," a downward sloping hairpin turn. Stretch your legs and rest your ride at Spavinaw Area at Grand Lake State Park, located on the western end of Spavinaw Lake, where turquoise water flows through a stream located below the lake's spillway. In 1922, the Spavinaw Dam was created to deliver clean drinking water to Tulsa. At the time it was built, it was the largest lake in Oklahoma and the pipeline created to carry the water was the longest in the continental United States. Located in Green Country, Highway 10 runs east to west for the first hundred miles, then north to south for the remainder. Begin your scenic tour north of Tahlequah and follow the serene banks of the Illinois River on a relaxing jaunt south on Highway 10. Follow the highway's path through breathtaking stone bluffs and lush forests and remember to keep your speedometer low, as Highway 10 is known for its curvy lanes and winding, low-visibility turns. Pull your motorcycle over into one of the many river outfitters that directly line this gorgeous highway and float down the Illinois in a raft or canoe, or travel south to Tahlequah's Cherokee Heritage Center for a dose of American Indian culture. Continue your scenic tour at the Fort Gibson Historic Site, located just north of the highway. This historic site, in operation from 1824 to 1890, was the first army post in Indian Territory. Between the 80 acres, 29 historic buildings, numerous archeological ruins and exhibits, it's a living piece of American history. Continue the smooth ride south to Braggs, home of the Camp Gruber Recreation Area and Greenleaf State Park. Or, visit Greenleaf State Park to wind your way through spectacular scenery complete with hiking trails, an 18-hole miniature golf course and abundant wildlife viewing. Hit the open road on your motorcycle in northeast Oklahoma on Highway 123, which spans roughly 20 miles to connect Barnsdall and Bartlesville. Begin in Barnsdall, once known as Bigheart, and see the only main street oil well in the country. Though not operational, the oil well is a great starting point for the trip ahead. Perfect for beginners, the smooth, flat road stretches out for miles, offering clear views of nature. Midway between Barnsdall and Bartlesville is the Woolaroc Ranch, Museum and Wildlife Preserve. Established in 1925 by oilman Frank Phillips, founder of Phillips Petroleum Company, Woolaroc has a world-class museum with 52,000 square feet of American Southwest history, featuring paintings, a bronze collection and Colt handguns on display. The 3,600 acre property surrounding the museum is home to herds of buffalo, elk, deer, longhorn steers and Scottish Highland cattle. Continue along Highway 123 for another 13 miles to Bartlesville's Price Tower. The tower, created by Frank Lloyd Wright, is considered one of the greatest buildings of the 20th century. Inside, visit the arts center which showcases collections and exhibitions of art, architecture and design, or take a guided tour of the tower. For more motorcycling routes across Oklahoma, check out Motorcycling in Western Oklahoma: Top Five Rides for ride-friendly routes available in the western half of the state!